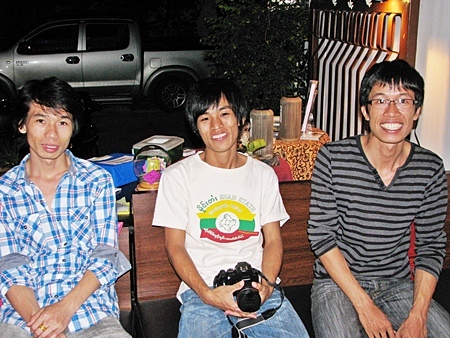 Yoom One is working to bring HIV/AIDS education and prevention to hilltribe migrant workers in Chiang Mai. 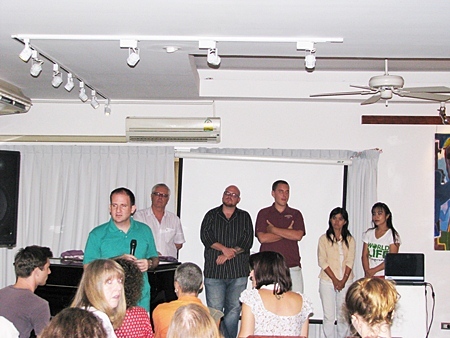 The Best Friend Library took the opportunity to introduce some new members of the Chiang Mai Non-Governmental Organization (NGO) community to a gathered crowd of interested supporters and friends at Sangdee Gallery on August 30, 2011. 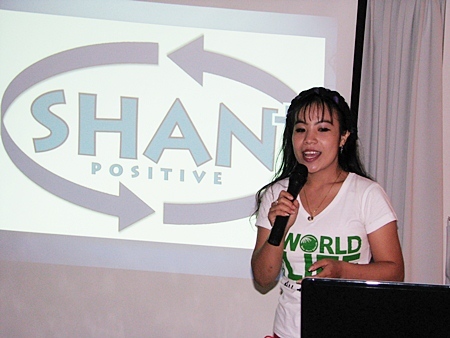 Two of the organizations are Shan and run by members of the Shan community while the other two are run by foreigners living in Chiang Mai and working to make a difference in peoples lives. Yoom One is spearheading the Shan Positive organization which is working to bring HIV/AIDS education to migrant Shan workers and other hilltribes in Chiang Mai. She provides not only financial aid to purchase medicines for treatment but counseling and support for those affected and their families. She noted that many Shan in Burma remain uneducated about HIV transmission and so a fear pervades villages where the patients live with them often being banished from the village for fear of contagion. She is working to educate people not only of the realities of infection, but also how to avoid it and other STDs. Then Dave Poppe introduced the ATMA SEVA Ambassadors program which is working to bring volunteer teachers to schools in Doi Saket. They have been teaching novice monks at the Temple School in Doi Saket English and then offering webcast ‘monk chats’ with groups around the world. He pointed out that this offered people, both Thai and western, the chance to share cultural experiences and learn more about different places. They hope to offer a student exchange, sending novice monks to the United States to a school that sends a student to Thailand. Shan Youth Power was introduced, and while not a new NGO, they are not well known and are working to help Shan youth and children and to persuade them to participate in the social and democratic process through education. They have classes in English and computer skills for Shan youth and offer education on HIV/AIDS prevention to migrant workers. Shan Youth Power put up the first Shan language website, a newsletter is published every two months offering information on language, culture, and education. They also established the Migrant Children School project offering basic education in the Shan, English, and Thai languages, mathematics and computer on nights and weekends for children and youth aged 5-25. These young men belong to the Shan Youth Power organization and helped out during the evening. Books, t-shirts and information was available for interested people. Members of all four groups took questions from the crowd. Chiang Mai Governor ML Panadda Diskul is joined by one of the representatives from the United States at the opening ceremony which saw representatives on stage using herbal ball massage. Many different kinds of massage therapy are on offer at the exhibit. 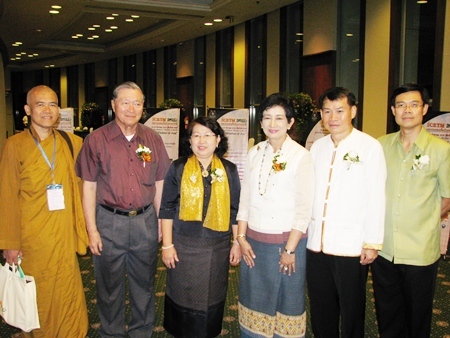 The Chiang Mai International Conference and Exhibition on Traditional Medicine TM 2011begain in Chiang Mai on Wednesday, August 24. The conference brought academics, traditional medicine doctors and healers from around the region and the world to meet and share experiences and interests at the Imperial Mae Ping Hotel. The Exhibition is on at the Central Hall at Central Airport Plaza and runs through Sunday, August 28. The conference was organized by the Faculty of Medicine, Chiang Mai University and supported by the Chiang Mai Provincial Public Health Office under the Lanna 1 Cultural Tourism Fund. 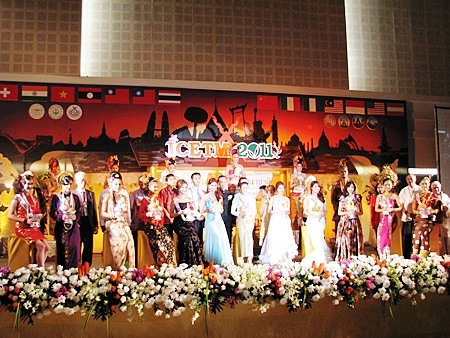 The conference is meant to help revitalize and restore Thai and Lanna traditional medicine by implementing cooperation on the international level, to network academically, to integrate international knowledge with that of Thai and Lanna people, and to create a roadmap that will help bring about these objectives. Representatives from Vietnam, Laos, Indonesia, Malaysia, Europe, the United States and Africa were at the conference comprising of academics, students, healers and traditional medicine doctors. The exhibition, which runs through Sunday, August 28, is filled with different types of massage, acupuncture, ayurvedic medicine, herbal medicines, teas, and plants. There are many unusual and informative booths at the exhibit but perhaps bring a plant dictionary as many of the packages are labeled only in Thai. 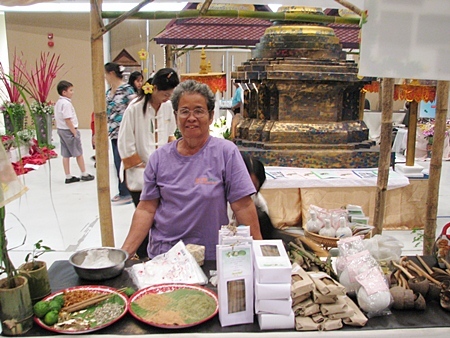 The exhibition is a unique experience, bringing together all the diverse methods of traditional healing and of great interest to those who follow herbal medicines and other alternative treatments. This traditional healer is selling different herbal cures. Deputy Governor Naruemol Plawat is joined by representatives from the Ministry of Public Health and many of the delegates at the opening dinner of the conference held at the Imperial Mae Ping on August 24, 2011. 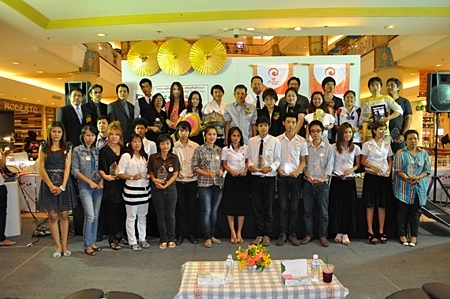 Sponsors pose for a group photo at Mokador Coffee Shop on August 25, 2011. 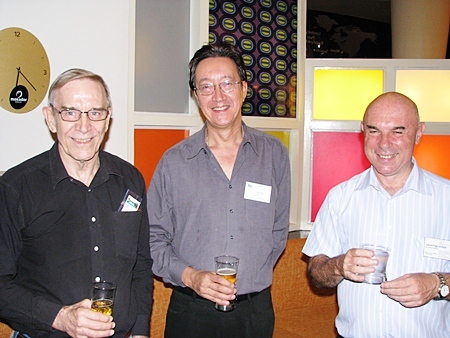 British Honorary Consul Ben Svasti Thomson is joined by Mervin Levin of Levering Limited (right) and Clarence Shettlesworth of Nugent Waterside Resort. 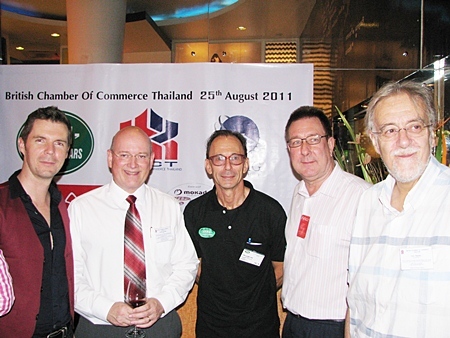 Lanna Classic Cars and Networking One held a British Chamber of Commerce in Thailand networking evening on Mokador on August 25, 2011. 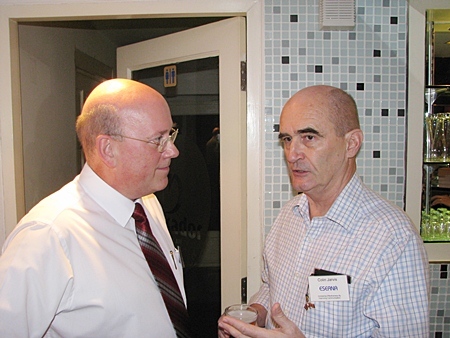 Mokador as always provided a pleasant, friendly atmosphere and good food for the guests who included BCCT Chairman Graham MacDonald and Vice Chairman Chris Thatcher as well as the British Honorary Consul Ben Svasti Thomson, sponsor Peter Smith of AA Insurance, and local businesspeople. Everyone was glad to see Rachel and Chas Begley get a night off, leaving their lovely baby with a baby sitter for a few hours and join the evening. Sponsor Lanna Classic Cars was introduced, for those with classic cars that need work or for those that want to find a classic car (the owner, Clive Richardson, played on my weak spot saying he knew of a beautiful BMW 2002 for sale in Bangkok!) Lanna Classic Cars offers an English speaking management to help enable quality work. They also offer a fleet of LandRovers for rent or lease but sadly could not park one out in front for everyone to see. The new partner in Mokador was introduced who said he wanted people to realize that Mokador was more than just a coffee shop, as was BCCT Vice Chairman Chris Thatcher. 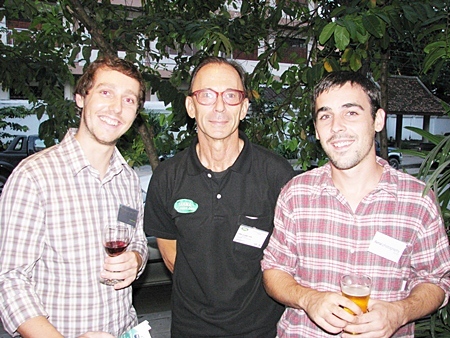 The BCCT networking evenings are open to all nationalities and that was evidenced by the collection of nationalities from French, to British, American, Thai, Dutch and more, proving that Chiang Mai, while it may be small, still sports an interesting mix of people here in business. 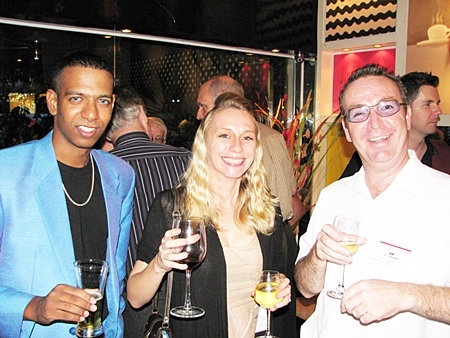 Sailesh Patel’s eyes match the suit as he joins Rachel Begley and Damian Casper. Lanna Classic Cars Clive Richardson was on hand to discuss LandRovers. with one of his jokes. policy they are bringing out. Vajira “Jo” Ruthirakanok and CMCC member Martin Venzky-Stalling hold up the latest map of big trees in the Nimmanhaemin area. The Chiang Mai Creative City Committee met at Deco Moda on Nimmanhaemin soi 1 to see the latest creation of local designer Vajira “Jo” Ruthirakanok; a map of the monumental trees in the Nimmanhaemin area. His original map of big trees in Chiang Mai came out in 2009 and mapped out all the large trees in public areas inside the moat. His latest map covers the public areas around the Nimmanhaemin area from just past Nimmanhaemin to Sirimangkalajarn. It is currently only available in Thai but the map is quite clearly delineated. Copies can be picked up from his studio Rabbithood on Nimmanhaemin Soi 1. Jo hopes to further expand into areas in and around Chiang Mai and is currently looking for funding to set up an interactive site that allows people to update the status of big trees around the city. He noted that he regularly has people contacting him to let him know of big trees under threat. He added that the biggest tree in Chiang Mai city has to be the magnificent Rain Tree at the Chiangmai Gymkhana Club, over 100 years old, the tree is amazing and the Gymkhana is open to the public should anyone wish to go see. Another initiative that has interested the CMCC is the no foam project recently instituted on the Sunday Walking Street and endorsed by Chiang Mai Municipality, which encourages the use of recyclable and biodegradable products including banana leaves, bamboo and containers made out of bagasse, or sugarcane waste. They will resemble foam containers but are totally biodegradable and used from renewable resources. The problems, organizers pointed out, is that the packaging can cost 30-40 percent more than regular foam packaging but the Municipality is helping to promote the idea by offering food vendors on the Walking Street Market signs saying they are providing their food in ecologically friendly packaging. It is hoped that will greater use, higher production will eventually bring costs down. But, they added that 50% of the food vendors on the Walking Street Market have made the switch to biodegradable packaging. The original Big Tree map shows the monumental trees inside the moat and can be found at Rabbithood Studio on Nimmanhaemin Soi 1. 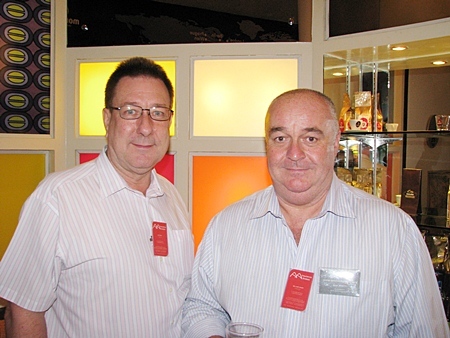 Members and visitors to the CMCC coffee morning at Deco-Moda on Nimmanhaemin Soi 1. This beautifully flowering Adenium, or Desert Rose (chuan chom in Thai) was artfully twisted into a gorgeous bonsai tree. These gorgeous orchids are on display and on sale at the event that takes place at Suan Buak Hat Park until Sunday. The Chiang Mai Bonsai organization, Queen Sirikit Botanic Park and the Municipality have sponsored a bonsai and orchid festival to give the rainy season some color this weekend at Suan Buak Hat Park in honor of HM Queen Sirikit’s 79th birthday celebrations. The event is under the theme of the three Gs and three Rs: Garden, Green,Greenitude and Reduce, Reuse and Recycle. With bonsai and orchid displays, competitions, plants for sale, and of course food and snacks, the park is alive with color on the gray rainy days. The event runs through Sunday so be sure to stop in and enjoy the beautiful displays. And if you are feeling brave, pick up an amazing bonsai plant and treat it with love as these intricate plants are quite amazing! in honor of HM Queen Sirikit’s birthday. One of the many Lanna inspired fashions on display at the awards. The Industrial Promotion Center for Region 1 and the Chamber of Commerce for the Upper Northern Provinces held a creative competition at Central Airport Plaza on Friday, August 5, 2011 where local artisans and designers showed off their creations. Ranging from fashion to furniture, food to jewelry and home decorations, the event featured many unique and creative items from people from around the North. Artists travelled from Lamphun, Lampang, Mae Hong Son, and Chiang Rai to join fellow artists at the event in Chiang Mai. Utilizing local products and cultural features, the competition featured a vast array of beautiful and useful items. Surachai Jongrak, Chiang Mai Provincial Secretary, was joined by Martin Venzky-Stalling of the Chiang Mai Creative City Committee, Rachan Veeraphan, Honorary Consul General of Bangladesh and other Chamber members in meeting the artisans and quizzing them about the resources used and the idea behind the product. Khun Rachan Veeraphan and Martin Venzky-Stalling joined other chamber members in judging the presentations at Central Airport Plaza. This unique decorative light was made from locally sourced materials. The Creative Lanna Award winners on stage after the presentations. (Photo courtesy of the Creative Lanna Awards). Soho Bar saw a change of owners this past weekend with Scott Taylor bidding farewell to the bar but not Chiang Mai and welcoming in new owners Shauna and her partner Rabbit! The party was well attended by friends and customers old and new who came to wish Scott well as he starts a new phase of his life, although it’s generally conceded that his impending retirement probably won’t see Scott very retired. 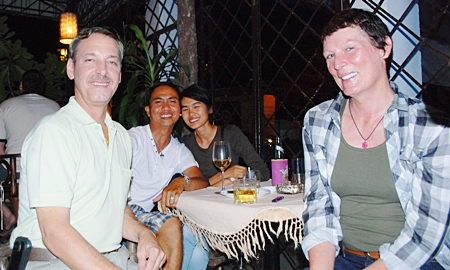 New owner Shauna is taking over the bar that has become a fixture on Huay Kaew Road. The party ran late into the evening as the place filled up with well wishers for both old and new owners. 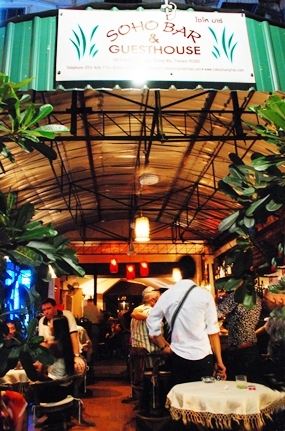 Soho Bar and guesthouse is a Huay Kaew Road fixture.